Join us and help end cancer! Fred Hutch's mission is the elimination of cancer and related diseases as causes of human suffering and death. We are inspired to ride for a variety of reasons but all hold the belief that together we can help Fred Hutch achieve their mission. Obliteride is fully underwritten and staffed by volunteers so 100% of your donation is used for research. JOIN US! There are a variety of ways to be involved including 25, 50 and 100 mile bike rides, a 5K walk and a variety of volunteer opportunities. Not sure how far you can ride? Join us for group training rides to improve your skills. 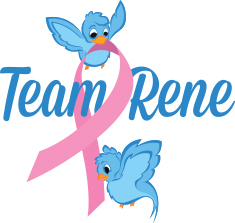 Team Rene is welcoming, supportive and passionate about ending cancer. We also want to thank our 2018 donors. You are appreciated and fuel the Hutch's life saving research. Since our first ride in 2014, Team Rene has rasied over $50,000, contributing to Obliteride's 6-year total which is now over $14 million. The great news is that your money is already hard at work funding research in a variety of areas. Please visit the ABOUT section of www.obliteride.org to learn where the money goes. We know that for those currently fighting cancer, new therapies cannot come fast enough. Research is the path to discovery and understanding, which leads to prevention, earlier detection and better treatments. Doctors and scientists at Fred Hutch work tirelessly, everyday, to make discoveries that lead to better outcomes. Because of your generous support, this research is accelerated and more lives are saved. Together we can OBLITERATE cancer and save lives faster! BOEING EMPLOYEES: Be sure to visit the GIVE website and complete a match request. Boeing will match your donation dollar for dollar, doubing your impact! If you need help with this process, please ask a team member for help. If your work for another employer be sure to see if they match funds as well.